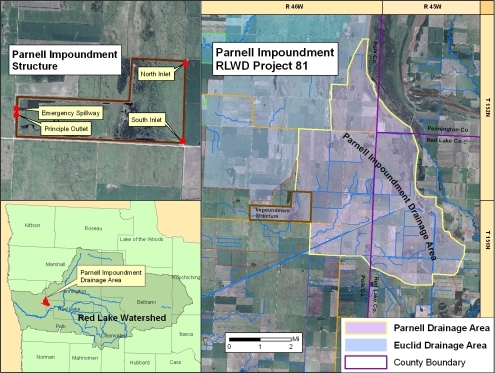 The Parnell Impoundment (RLWD Project 81) is located in Sections 3 and 4 of Parnell Township in Polk County. It is approximately 12 miles northeast of Crookston, and about 2½ miles east of U.S. Highway 75. The drainage area above the dam is approximately 23 square miles. The Parnell Project is designed to reduce flooding on downstream agricultural lands and urban areas by retaining up to 4,000 acre-feet of runoff. The reservoir storage will also reduce peak discharges on County Ditch 26, Judicial Ditch 60, County Ditch 66, and County Ditch 2. The impoundment structure incorporates a 2-pool design (with no permanent pool), two separate outlets, and an interpool connecting channel. The embankment and reservoir are constructed of approximately 5 miles of earthen embankment (as high as 18 feet), a concrete emergency spillway and two gated concrete outlet structures. Operable components include the two gated structures which release water from the impoundment into two separate outlet channels. One channel, JD 60, flows into the Red Lake River. The other channel, CD 126, flows west into the Grand Marais drainage basin, and into the Red River of the North. Construction of the Parnell Impoundment began in 1997 and was completed in 1999. In 2003 modifications were made to the original design by lowering the emergency spillway 1.5 feet, expanding the interpool connecting channel, and installing an operable screwgate on the JD 60 outlet weir structure. The impoundment is now better utilized to store floodwaters by operating control gates. The overall cost of construction was approximately $3,200,000 and was jointly funded by the Red Lake Watershed District and Red River Watershed Management Board.